Photo by Mark Lyons, courtesy of the Cincinnati Symphony Orchestra. 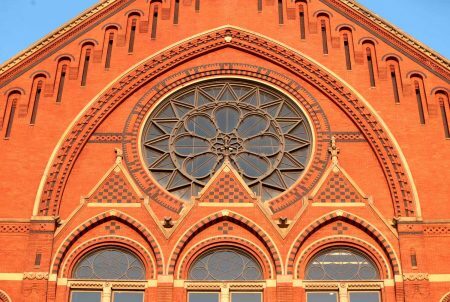 On October 6, 2017, Music Hall, one of Cincinnati’s iconic treasures, will reopen to the public after extensive renovations for the past 18 months. Revered worldwide not only by musicians and performers but also patrons of the arts, our Queen City’s Music Hall was designed and built in 1877-1878 by locally renowned architect, Samuel Hannaford (1835-1911), in a combination of High Victorian Gothic and Romanesque styles. Fine acoustics and beauty inside and out have allowed generations to appreciate this building, but after almost 140 years, it was showing its age and in need of rehabilitation and care in order to proceed into the 21st century. Unlike other centers for arts and music which have a certain detachment from the surrounding city (i.e. think of Washington’s Kennedy Center or New York’s Lincoln Center), Music Hall is an integral part of the Over-the-Rhine neighborhood, and it comes in direct contact with bordering sidewalks without setbacks. The richness in detail of this Victorian building is a close-up delight to the eyes with much symbolism and meaning carved into its surfaces. Like a musical score, the façade brilliantly marches along with a rhythmic pattern of building massing, arches of several variations, and decorative horizontal banding acting as ribbons wrapping a beautiful package. Song birds, flutes, violins, lyres, French horns, and woodwinds have been lovingly carved into stonework to allow pedestrians to realize that this enormous structure is a shrine to music. Its crown is completed with a huge rose window, placed high on-center above the building’s entrance and framed within a Gothic arch on steroids. Eyes are drawn upwards to notice Music Hall’s dramatic silhouette against the sky with its peaks, pinnacles, gables, and broad roof planes: this is our city’s cultural cathedral for the ages. Originally constructed both for music and as an exposition hall of exhibits, wrestling, boxing, basketball, tennis courts, and equine events, Music Hall has been adapted successfully through the decades which have enabled it to survive. The Cincinnati Symphony Orchestra was actually founded in 1895 – 17 years after the building’s opening. Performances began at Pike’s Opera House (formerly on East Fourth Street), then moved to Music Hall in 1897. Patroness Mary M. Emery felt that the Symphony deserved its own home, and she hired Samuel Hannaford & Sons (the successor architectural firm led by Hannaford’s sons) to create the 2,200 seat Emery Auditorium on Walnut Street at Central Parkway. Located there from 1912 until 1936, the Symphony then moved back to Music Hall as its permanent address. 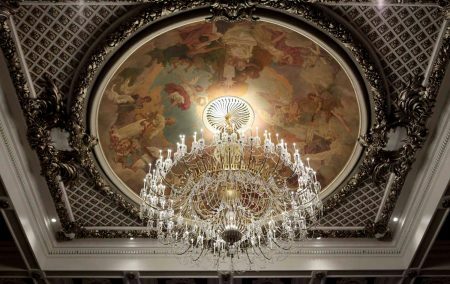 In time, the Ballet, Opera, Cincinnati Pops, May Festival, and other musical events, graduations, parties, and antique festivals joined forces to occupy and utilize Music Hall. 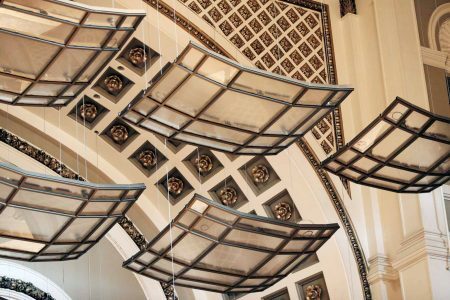 New Acoustic Baffles at Proscenium Archway in Springer Auditorium Allowing the Audience to Look Through Them. Before renovations, Music Hall was one of the largest concert halls in the country. Because of this enormity, the Symphony Board wanted Springer Auditorium (the name of Music Hall’s theater) to be reduced in size from 3,300 to 2,200 – 2,500 seats. 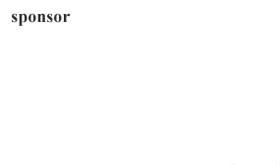 Ironically, the seating capacity of Emery Auditorium is exactly the number that the Symphony now wishes for Springer Auditorium. A laundry list of alterations contributed to the $143,000,000.00 price tag for the building’s renovation: new seating; carpeting; HVAC; plumbing; lighting; electrical system; sound baffles; deeper and taller backstage area; an adjustable and projecting stage for performances; escalators; elevators; stairways; dressing rooms; locker rooms; bathrooms; concession areas; wider corridors; and so much more. On August 17, a diverse group of several dozen people, including this writer, had the privilege of receiving a behind-the-scenes tour of this hard hat construction site, with just weeks to go before the grand reopening. The Pittsburgh architectural firm, Perfido Weiskopf Wagstaff + Goettel (known locally for the 21C Hotel) and Martinez & Johnson Architecture of Washington, D.C. with Messer Construction have skillfully led the renovations, and, although much work remains to be completed, they undoubtedly will meet this stringent schedule. Springer Auditorium’s Domed Ceiling with Crystal Chandelier. The interior décor is in shades of grays and beiges with silver leaf accents for mouldings and column capitals. Wine-colored carpeting and seating upholstery add to the visual warmth of the spaces. Much attention has been spent on lighting – both artificial and natural – throughout the building. During its 140 year history, many windows were “bricked-up”, causing Music Hall’s interior to turn inward and visually separate from the city. Although many performances take place at night, reopening windows now allow splendid views of the redesigned Washington Park and Downtown’s glittery skyline. Importantly, these windows permit Music Hall to sparkle in the evening and provide a very inviting, appealing sight to behold. The new Corbett Tower, located over the building’s Elm Street entrance, is a favorite space which has been restored. Named after J. Ralph and Patricia Corbett who undertook Music Hall’s last major renovation in 1969-1973, this baronial-proportioned, elegant room with its soaring, coved ceiling has been stencil painted based upon its original pattern and coloration. Several large crystal chandeliers, purchased by the Corbetts and which formerly hung in Music Hall’s Foyer, fittingly have been relocated to the Corbett Tower. Large windows in this chamber have been reopened and allow people outdoors to look above and notice these chandeliers, as well as the illuminated coved ceiling, in approaching the building’s street entrance doorways. Although much emphasis in Music Hall’s renovation has concentrated on its interior, an important exterior detail has been restored: the black-dyed bricks of banding which enliven the overall red brick façade. Removed years ago due to sandblasting, these black bands of brick add interest and articulate the otherwise vast expanses of red masonry. Returning this detail, along with the reopening of bricked-up windows, has done much to enrich this grand old lady’s appearance. Only one last major question remains, and that is if the numerous interior alterations have negatively impacted Music Hall’s acoustics. It is a risk which city leaders, musicians, and patrons felt needed to be taken. Hopefully, the project’s expert acousticians have accurately calculated the adjustments necessary to maintain Springer Auditorium’s legendary sound for music patrons and actually improve sometimes troublesome acoustics for musicians on stage. Some of the design changes directly affect acoustics which include altering the angle and building materials of the original splayed plaster walls, replacement of the underlying floor from wood to concrete, elimination of approximately 800 seats and the bodies sitting in them, making the overhead balconies steeper, and extending the stage well beyond the line of the beloved proscenium archway. Between now and its October reopening, many trial performances will take place testing the acoustics, and allowing necessary adjustments to achieve exacting standards and accommodate personal preferences. 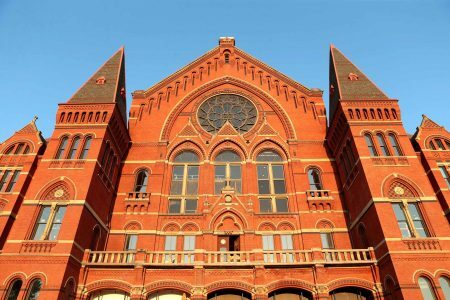 Cincinnatians will be able to take great pride in Music Hall’s reopening. Holding court majestically on the western edge of a rejuvenated Washington Park, Music Hall has become the center of performing arts along with neighboring institutions, including the restored Memorial Hall, the park and its scheduled outdoor activities, the new Cincinnati Shakespeare Co.’s Otto M. Budig Theater, and the School for the Creative and Performing Arts. This nucleus of splendid musically-and-performance-oriented facilities is unique, which shall bring attention and enjoyment to many. Although a number of people through the years can take rightful credit in helping make this cultural center come to fruition, Reuben R. Springer (1800-1884), who originally contributed over $250,000.00 (more than half of the initial cost) in creating Music Hall, deserves this ultimate honor. It was his dream not only to build a hall dedicated to music but also surrounding it with other cultural arts institutions to achieve this center enveloping Washington Park. Even the Cincinnati Art Museum (founded in 1881) was envisioned for this location instead of Eden Park, so that they could support each other.